PacMan is a yellow creature that is in difficult conditions. He needs to eat the scattered points and not get into the clutches of terrible enemies. This map also includes an addon with textures that adapts MCPE for this wonderful game. 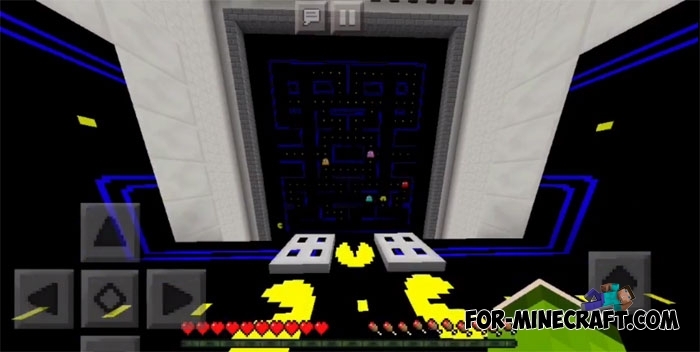 You could already see the Minecraft Pac-man Edition map where you are Pac-Man, wander through the mazes and collect yellow points. That map is different in that you will be in the role of Pac-Man. But this map was developed in a different way thanks to the command blocks and stylized textures. 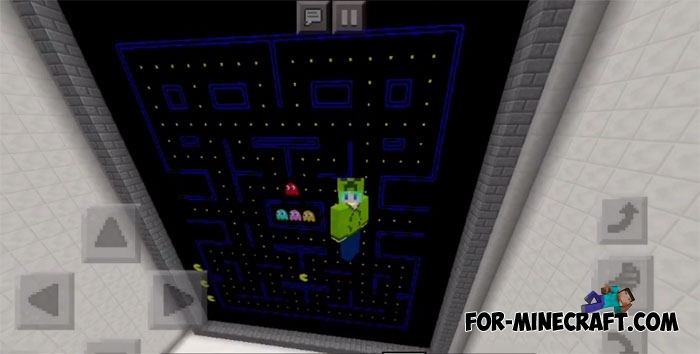 As a result, you can see the re-created PacMan in Minecraft PE, where the player controls the character from the control room. A large screen is in front of you, control Pacman and pass the levels without touching the monsters.